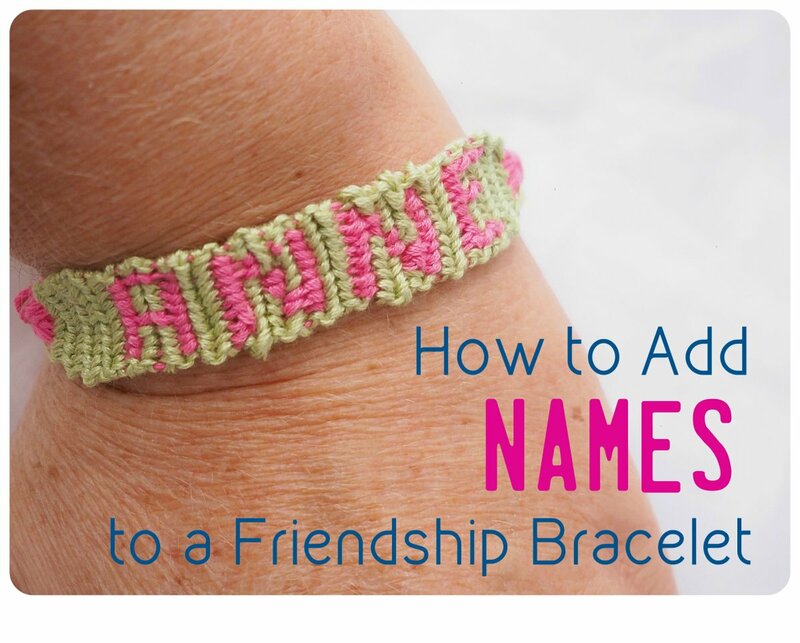 Having written an article recently about making the most simple Friendship Bracelet, I wanted to quickly follow it up with my favorite Friendship Bracelet design. 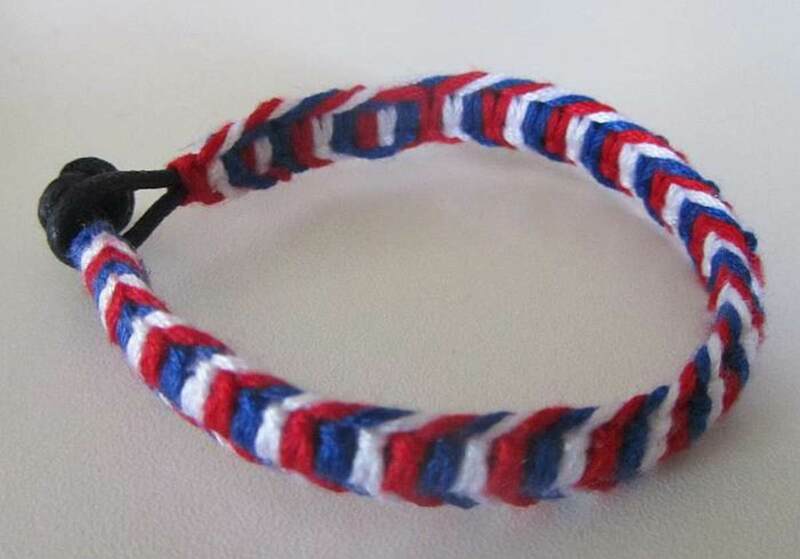 It is a design that I was not aware of way-back-when in school, when making these bracelets was so popular. The design is also surprisingly simple. I have taught the technique to a group of 8-10 year olds and they picked it up easily. I'll have you knotting in no time! Depending on your taste, a thicker piece of cord, string, or even a shoelace. The great thing about this project is that is inexpensive. Most people already own scissors and tape and embroidery floss is only $0.49 a roll at Michaels. You will need embroidery floss, scissors and tape. Cut approximately 30 inches of each color of embroidery floss. Like with the simple Friendship Bracelet in my other hub, the more threads you use, the thicker your bracelet will be. Today, I used 4 threads, but admittedly, that made a very thin bracelet. You will be tying these thread to one central cord. Once you get the hang on this, you'll be able to make an informed choice about the thickness of this central cord. 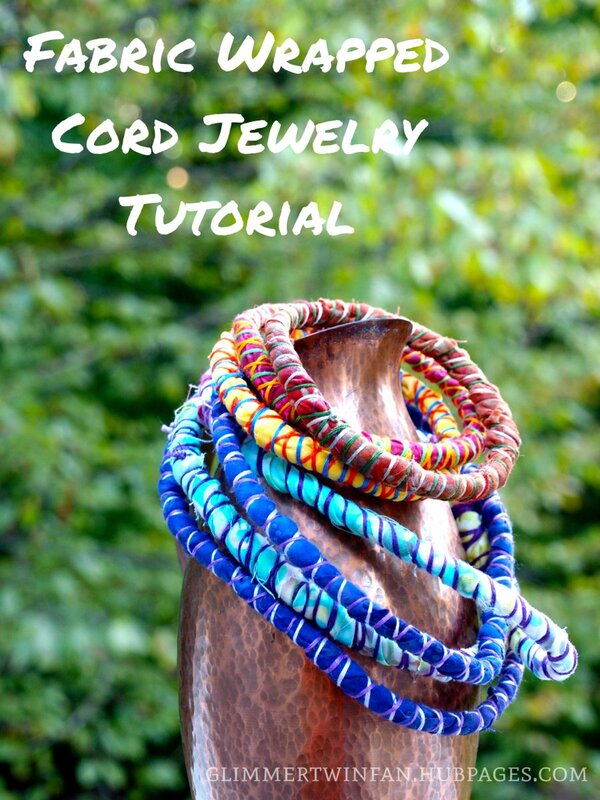 As you'll see, a thicker cord will give you a bigger bump in the bracelet. But you can simply use a piece of embroidery floss for now. This central piece can be much shorter - long enough to fit around your wrist and tie off. 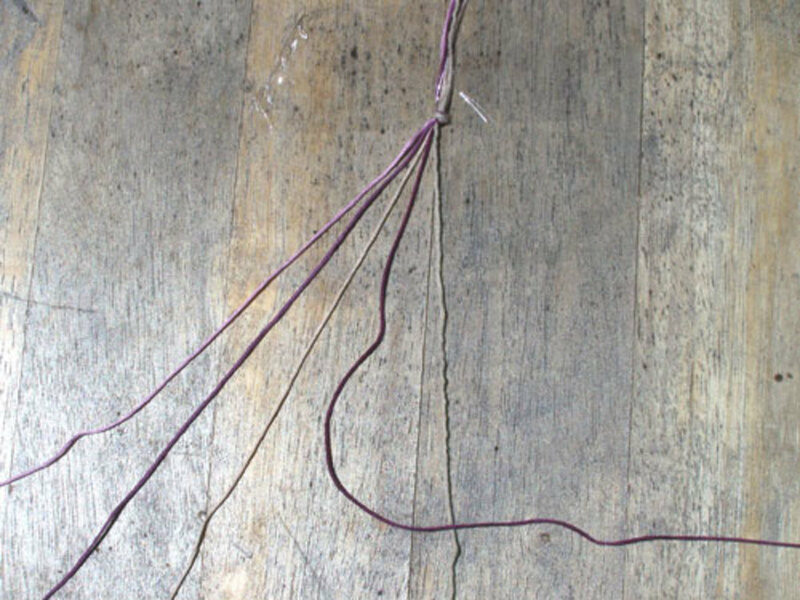 Hold all your embroidery floss as well as the central cord of your choice and tie a knot leaving a 2 inch tail. 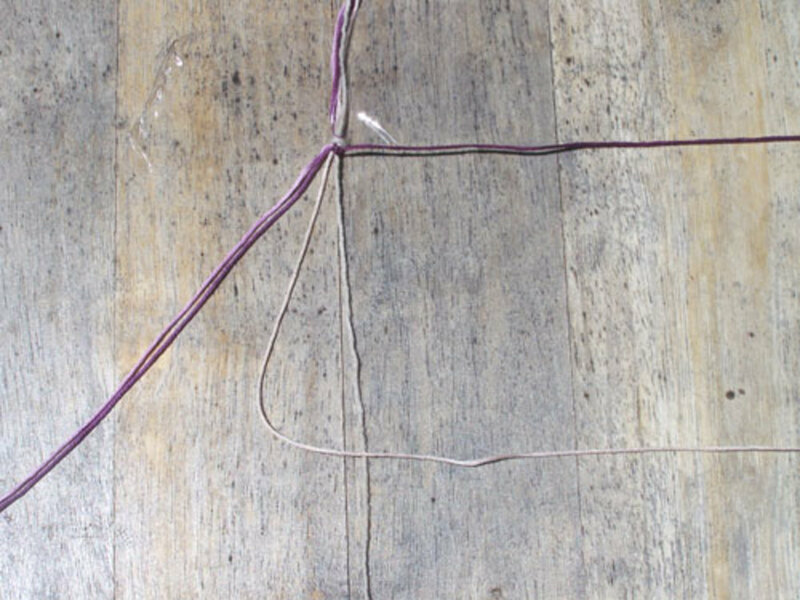 Tape the knot down to a flat surface and lay your threads out. Alternatively, use a clipboard to hold the knot in place while you work the bracelet. 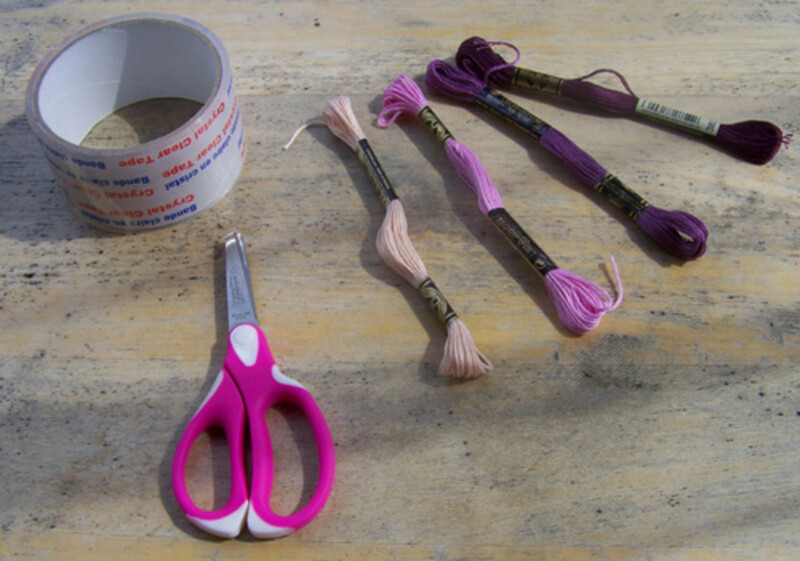 Your central cord (the cord to which all your embroidery floss will be tied to) should lay on the far right and your other strings should be laid out in an order that you find visually appealing. 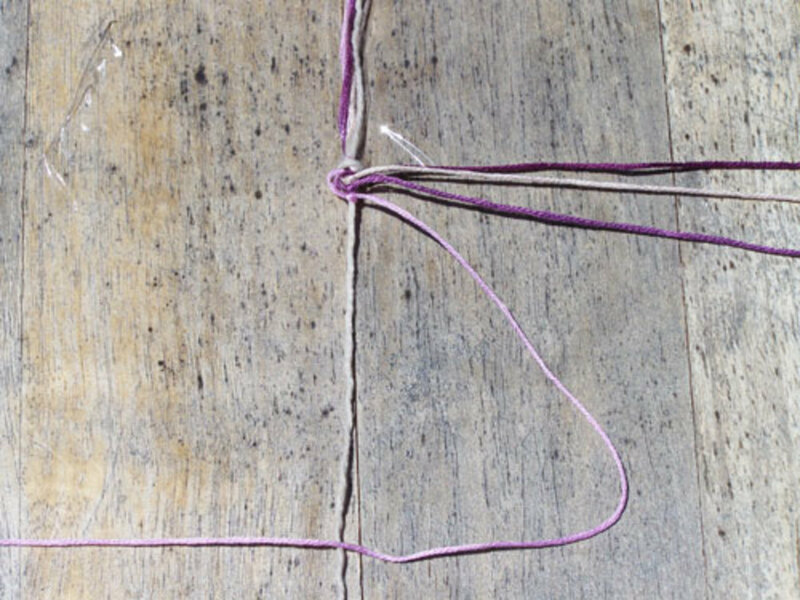 Start by tying a double knot with the string closest to your central cord. 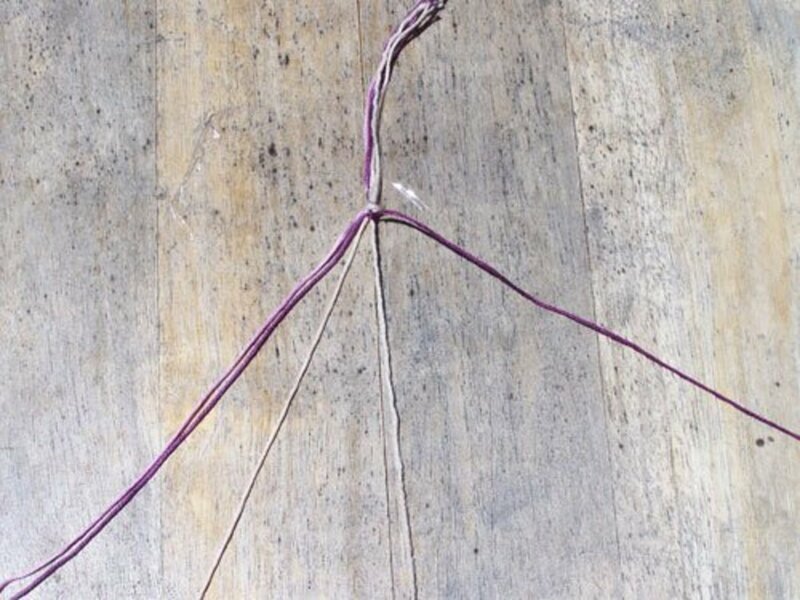 The trick is to make a '4' with the strings. Holding the central cord firmly in your right hand, pull the tail of that first strand under and through the hoop. Do this twice. 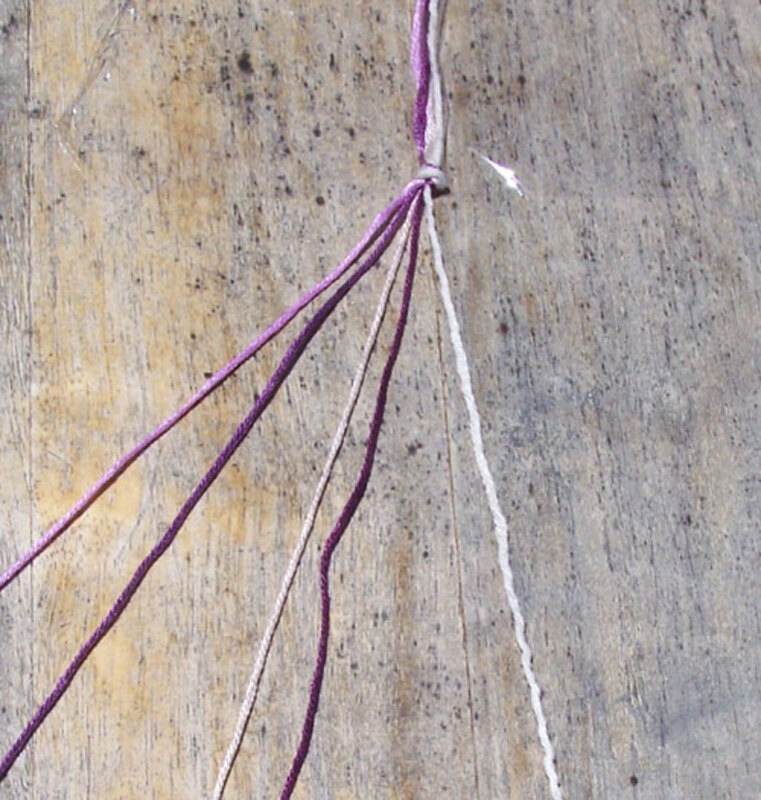 Take the string that you've just double knotted over the central cord and move it off to the right. Now double knot the next strand over the central cord. Tie the knot loosely so that you get a nice bump. In the picture below, I've completed my first set of knots onto the central cord. Now it's time to work backwards and tie each strand back onto the central cord. 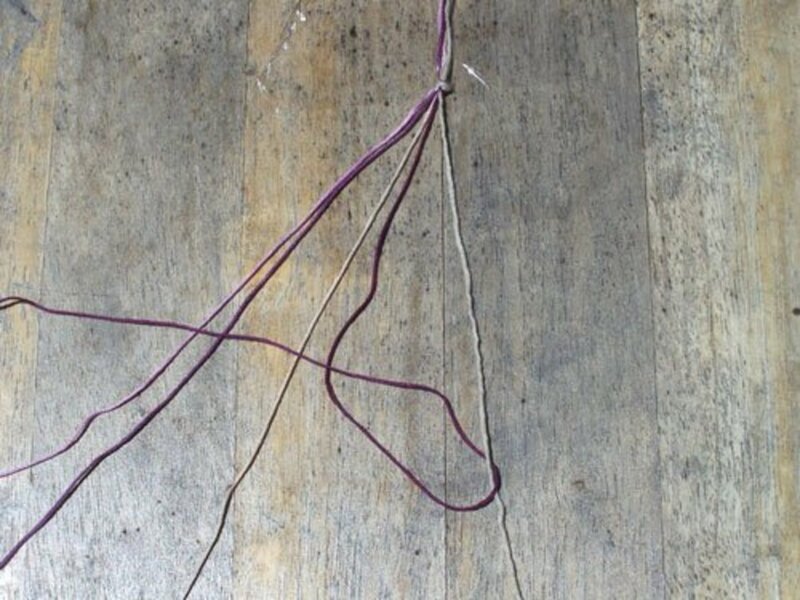 To do that, you'll need to make a backwards '4' and tie each strand loosely onto the central cord, starting with the strand closest to the central cord. Below, I've completed 6 sets - forward, backward, forward, backward, etc. Do this until the bracelet reaches the desired length. 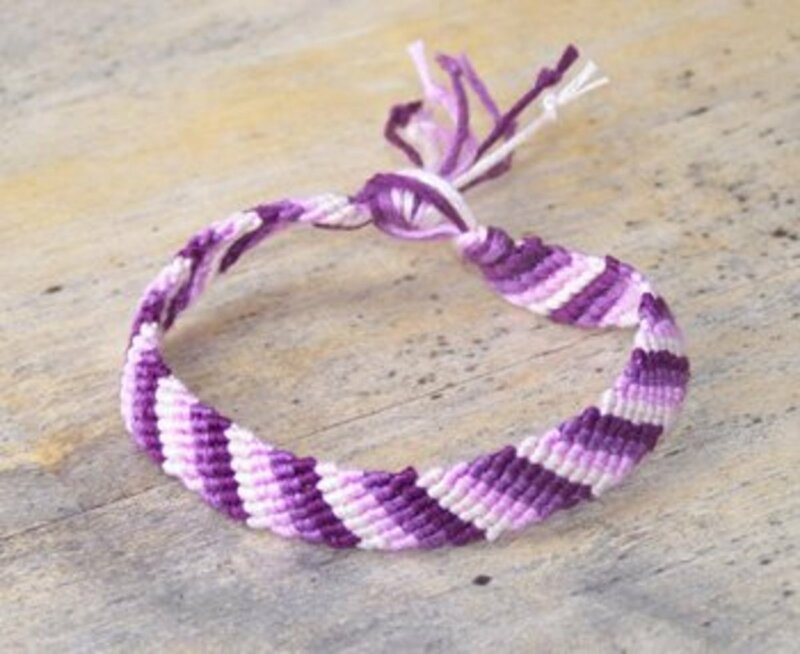 To close the bracelet, tie a knot using all the strings. 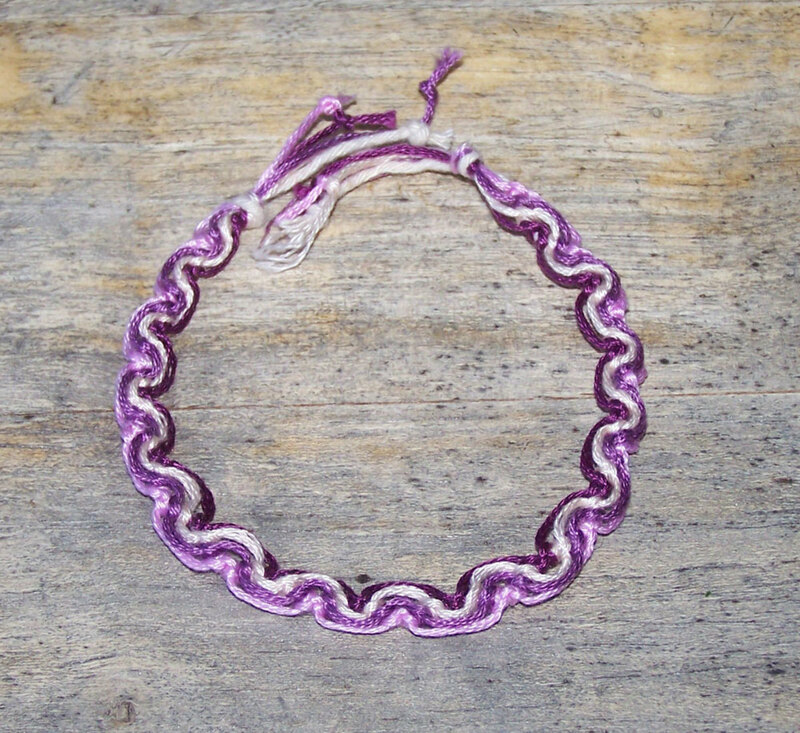 The bracelet below uses 8 strands of embroidery floss, making a wider, more vibrant bracelet. The brown, black, red and white bracelet on the right of this picture uses two thick central cords, giving the bracelet a double bump. 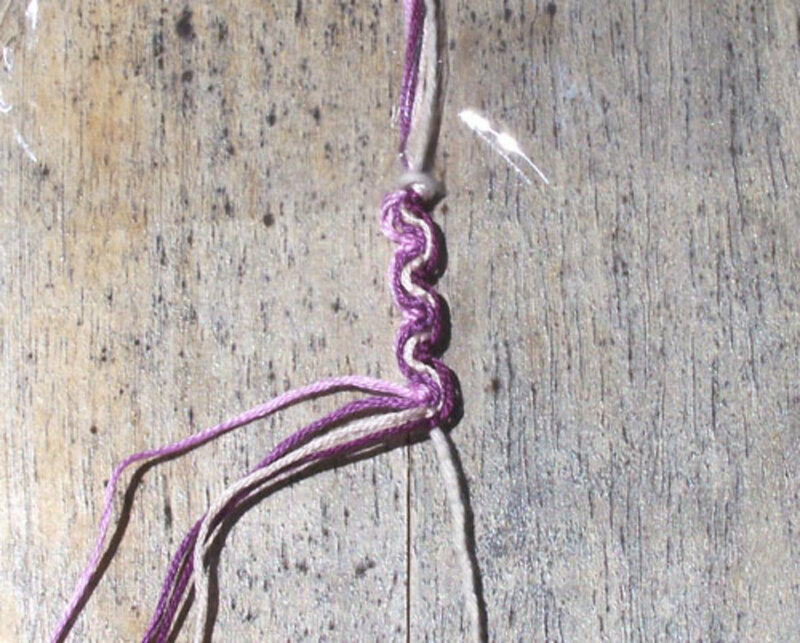 To do this, knot your thread onto the first central cord and then onto the second. Just make sure you allow for the extra embroidery floss needed to cover both cords. Add another 10 inches or so to be on the safe side. This reminds me of my youth, when I've made tons of friendship bracelets as a hobby and didn't sell them. I wish I did, since I love my designs and the kit. Voted up for awesome! 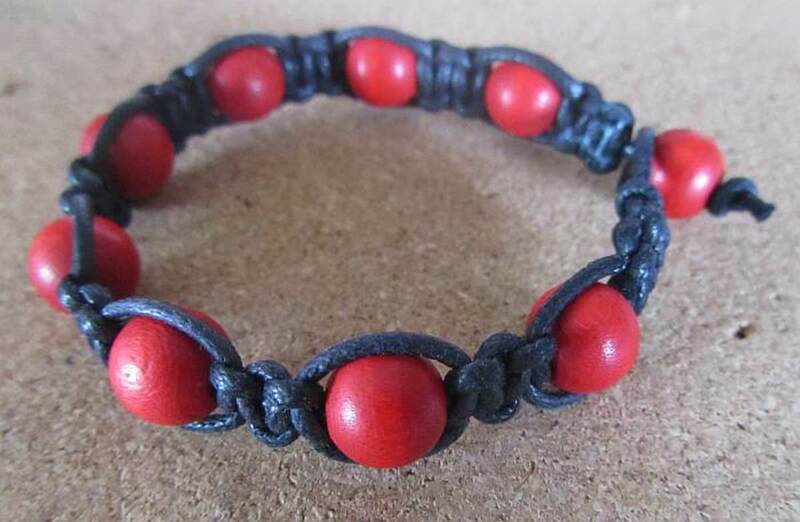 Really awesome bracelet! Thank you! Thank you! I have a few more design ideas. I better get working. This one is pretty simple and cute!!! Points taken, Paul. Thank you. I was looking at new hubs and saw this. It's a really great hub. Excellent instructions and love the pictures. The full width images with the instructions underneath is top notch. I want to offer two tips. 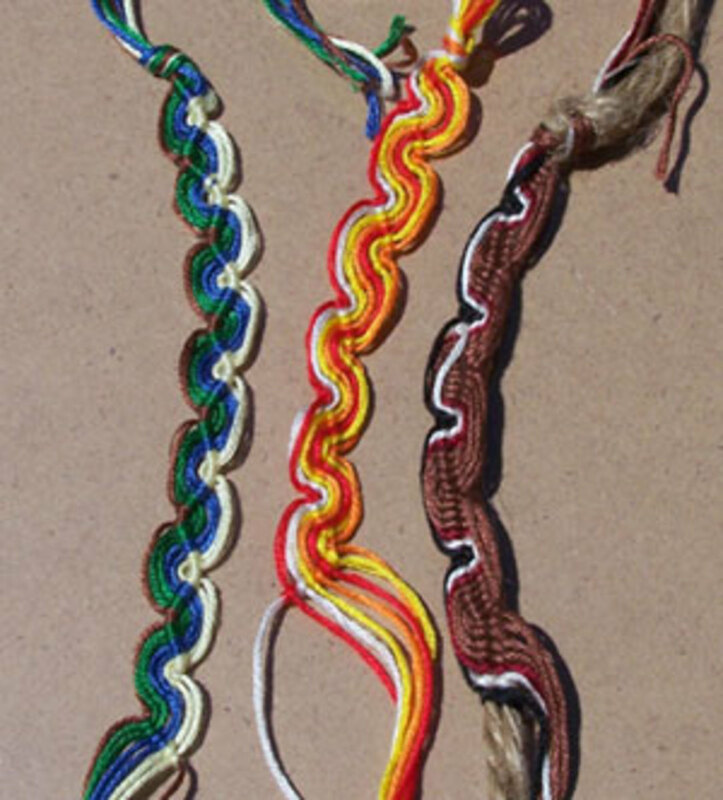 A more price title like "how to make a peruvian wave friendship bracelet" is a bit more precise and reader friendly. Lastly, make sure the amazon products are directly matched to the hub. Offering products from amazon for the string, scissors and tape will be well received. I really love the hub!